NBC Sports Live is an online streaming service that allows U.S.-based users to watch sporting events and shows produced by NBC Sports on their mobile platforms both live and on-demand. 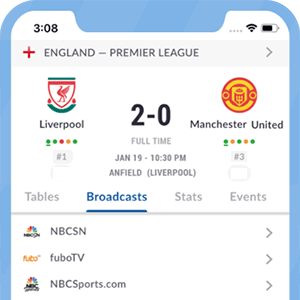 Launched in 2012, users have the option to follow all sporting events by NBC, including those from NBCSN, via mobile apps developed for iOS, Android and Windows smartphones. Likewise, this service is available on Apple TV, Roku and Amazon Fire. Users will need to authenticate using credentials from their cable/satellite/internet service providers. All of NBC Sports Live's apps are free of charge. This service can be accessed by users from the following pay-TV providers: AT&T U-verse, Time Warner Cable, Verizon FIOS, Suddenlink Cable, Dish Network (via Sling TV), DirecTV, Cablevision Optimum, Charter Communications, Comcast Xfinity, Cox Communications, PlayStation Vue and more. Check out our guide to learn which pay-TV providers give access to NBC Sports Live content on their website. This platform covers a vast majority of sports, such as soccer, basketball, golf, baseball and car racing, most specifically, NASCAR. Football fans will only be able to watch games on their computers, since Verizon owns exclusive streaming rights for mobile devices. NBC Sports Live may stream live Premier League games, both live and on-demand. *Got itLive Soccer TV does not provide NBC Sports Live live streaming. The information provided on this page is simply NBC Sports Live soccer TV schedule. Starting with the season 2017-18, NBC Sports Live Extra will no longer offer all 380 EPL matches. With the creations of the new service NBC Sports Gold, matches that are available via that service (130 Live EPL Matches) will no longer be available on NBC Sports Live.